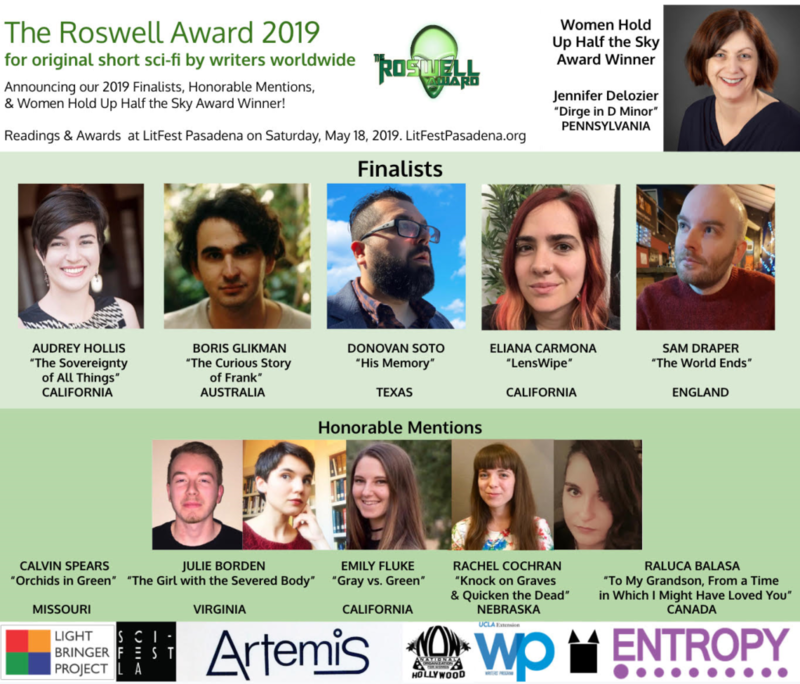 The finalists for the 2019 Roswell Award for short science fiction by adults have been posted. Also, Jennifer Delozier’s story “Dirge in D Minor” has been named the winner of the Women Hold Up Half the Sky Award presented by Artemis Journal & the Hollywood Chapter of the National Organization for Women (Hollywood NOW). 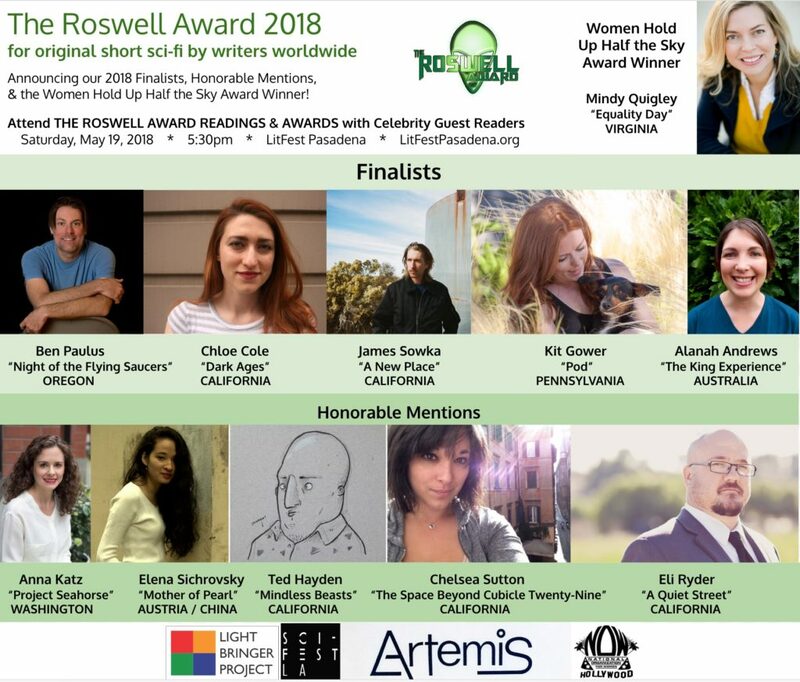 At LitFest Pasadena on May 18, celebrity guests will read Delozier’s story and the five Roswell finalists’ stories, after which the first, second, and third place Roswell winners will be announced. 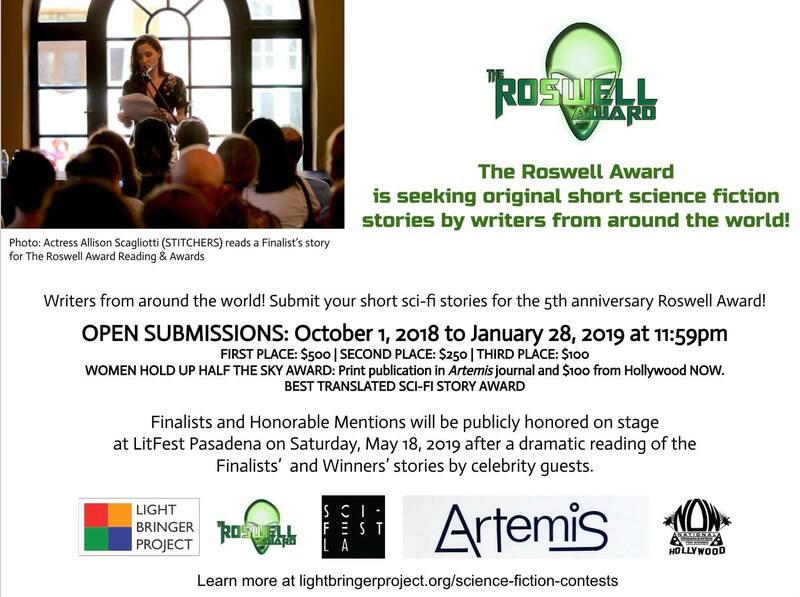 The 2019 Roswell Award for short science fiction by adults (18+) is accepting entries through January 28, 2019. The Roswell Award was created in 2014 to identify, encourage and promote up-and-coming science fiction writing talent among adults worldwide. The 2018 contest winner was “Pod” by Kit Gower. Entries must be original science fiction short stories no longer than 1500 words, by a writer over the age of 18. Sci-Fest L.A. and Light Bringer Project seek to identify and nurture new science fiction writing talent in all corners of the globe. 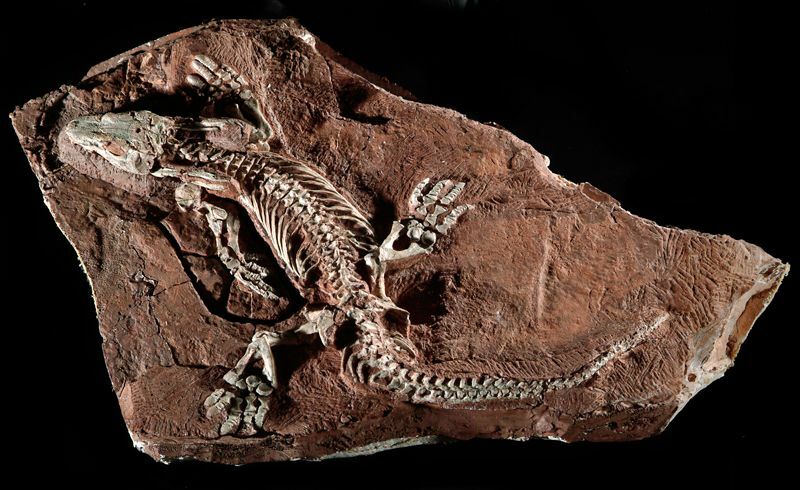 Science fiction writing provides a unique opportunity for writers to develop the ideas and narratives that will shape the future of humanity from how we address pressing scientific, social, philosophical, and environmental issues to inspiring us to develop new technologies and explore outer space. And of course we’re excited to see stories that entertain. We are proud to be taking a leadership role in developing the next generation of science fiction writers. 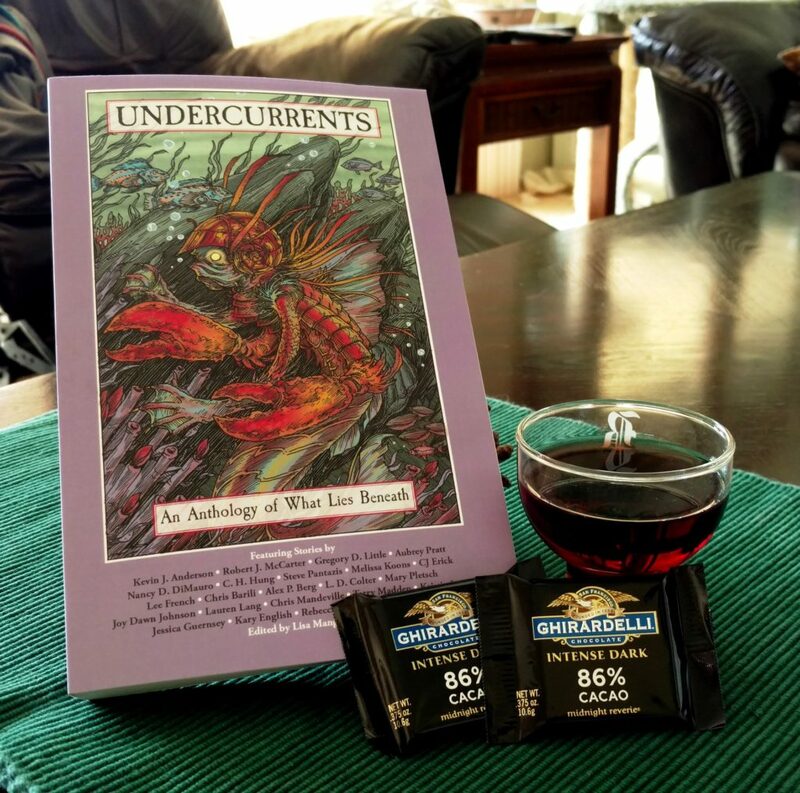 Four to six finalists will be chosen and their stories read dramatically by celebrity guests in a special performance at LitFest Pasadena on Saturday, May 18, 2019 followed by an awards presentation. First, second, and third place winners will be chosen from the finalists. Other special prizes will also be presented. Women Hold Up Half the Sky Award presented by Artemis Journal and the Hollywood Chapter of the National Organization for Women (Hollywood NOW): Publication in Artemis Journal and $100 USD from Hollywood NOW. Best Translated Science Fiction Story: This award is for a story that has been translated into English, and will go to a writer and translator team. [The “Women Hold Up Half the Sky Award”] recognizes a science fiction story that embraces feminist themes and has a strong female protagonist. Top entries will exemplify excellence in feminist storytelling, while capturing the complexities of their characters. Applicants who wish to be considered for the Women Hold Up Half the Sky Award must indicate this on their cover page / their submission email. Stories submitted for this award will be considered for other prizes if they are not a Women Hold Up Half the Sky winner. Stories are eligible for only one prize. The winner of 2018 Roswell Award for short science fiction by adults was announced at LitFest Pasadena on May 19. Celebrity guests read the five finalists’ stories, after which the first, second, and third place winners were revealed. The winning story will be published both by Artemis Journal and Hollywood NOW, and will be read aloud on stage by a celebrity guest. The finalists for the 2018 Roswell Award for short science fiction by adults have been posted. At LitFest Pasadena on May 19, celebrity guests will read the five finalists’ stories, after which the first, second, and third place winners will be announced. The 2018 Roswell Award for short science fiction by adults (18+) is accepting entries through January 29, 2018. The Roswell Award was created in 2014 to identify, encourage and promote up-and-coming science fiction writing talent among adults worldwide. Last year’s winner was Richard Larson’s story “Fifteen Minutes Hate”. Four to six finalists will be chosen and their stories read dramatically by celebrity guests in a special performance at LitFest Pasadena on Saturday, May 19, 2018 followed by an awards presentation. First, second, and third place winners will be chosen from the finalists. Special prizes will also be presented by partnering organizations. Special Prize — The “Women Hold Up Half the Sky Award” presented by Artemis Journal and the Hollywood Chapter of the National Organization for Women (Hollywood NOW): Special publication in Artemis Journal and on the Hollywood NOW site and $100 USD. 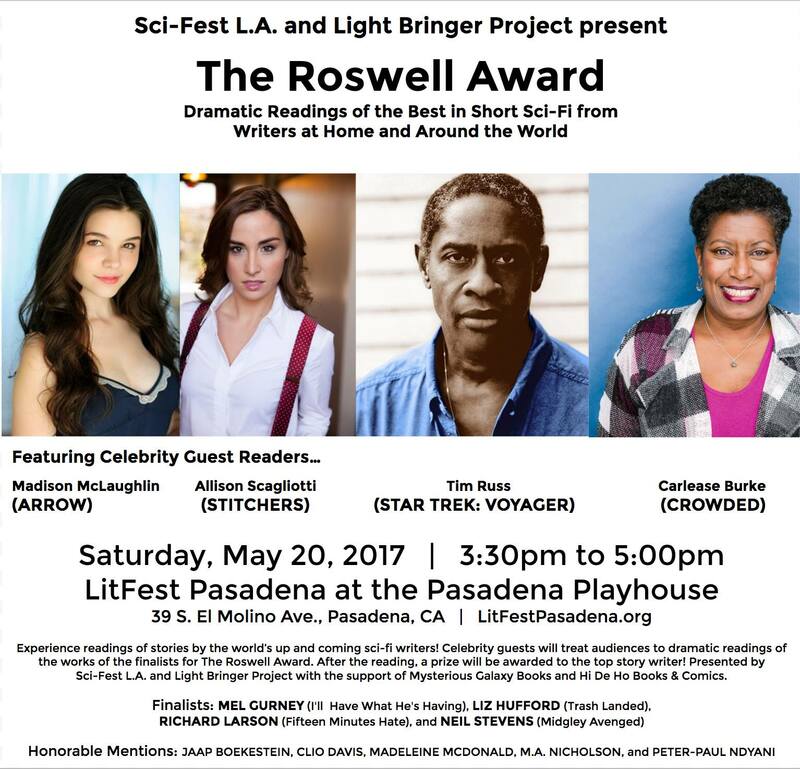 On May 20, Sci-Fest L.A. will partner with LitFest Pasadena for dramatic readings of the finalists’ stories for The Roswell Award for short science fiction by adults. The event will begin at 3:30 p.m. at the Pasadena Playhouse. Admission is free, but seating is limited. HONORABLE MENTIONS: Jaap Boekestein, Clio Davis, Madeleine McDonald, M. A. Nicholson, Peter-Paul Ndyani. Entries for The Roswell Award, sponsored by Sci-Fest LA, are being taken through March 3, 2017. The Roswell Award was created to identify, encourage and promote up-and-coming science fiction writing talent among adults worldwide. Entries must be original science fiction short stories (not plays), no longer than 1500 words, by a writer over the age of 18. 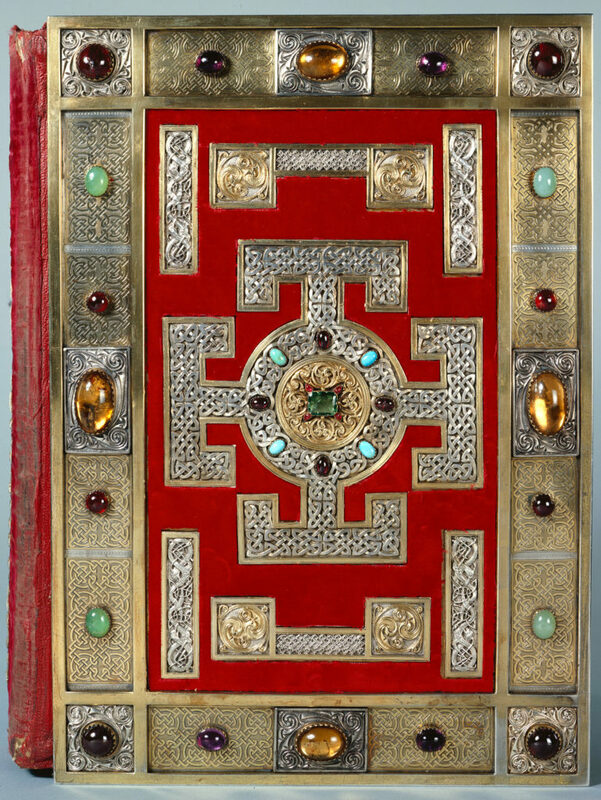 The author of the winning entry will receive a cash prize of $500. Five finalists will have their stories read dramatically by celebrity guests in a special performance at LitFest Pasadena on Saturday, May 20, followed by an awards presentation. One winner will be chosen from the finalists. Rules and submission guidelines are available at the event’s Facebook page. Liam Hogan’s short story “Tribbulations” is the 2016 Roswell Award winner. The author will receive a cash prize of $1,000.00. Hogan is a London based writer and host of the monthly literary event Liars’ League. He was the winner of Quantum Shorts 2015. He was also a finalist for the 2015 Roswell Award, and has had work published by DailyScienceFiction and in Sci-Phi Journal. All finalists in the short story contest were read aloud at Sci-Fest LA during the award ceremony on Sunday, May 22, 2016. 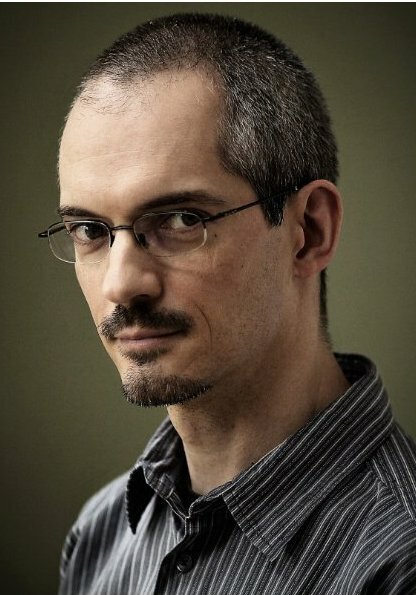 Hogan’s story was read by Philip Anthony-Rodriguez, an actor whose genre work includes Star Trek: Enterprise, Grimm, Star Wars Rebels, and a lot of video games. Among the other readers were Carlease Burke and Dee Wallace.